THIS PAGE CONTAINS HIV PREVENTION MESSAGES THAT MAY NOT BE APPROPRIATE FOR ALL AUDIENCES. How are these diseases spread? How can you protect yourself? What are the treatment options? 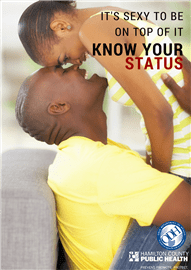 Learn the answers to these questions by reading the STD Fact Sheets. Also learn about Perinatal Syphilis Testing Protocol and click here to read our STD and HIV Reports online. We offer FREE HIV and syphilis testing at our Clinic. For questions, or to schedule an appointment, call 513-946-7611 or 513-946-7637. You can find other Local STD Testing here. You may also search a database of testing places by clicking here to go to OHiv.org or use the widget below from HIV.gov. Hamilton County Public Health is a provider of Partner Notification Services to persons infected with HIV and Syphilis. Specifically trained staff notify partners of their possible exposures and offer appropriate services, including examination, treatment, and referrals. If you are HIV+ or have been diagnosed with Syphilis and would like to notify sexual partners of a possible exposure, please call Hamilton County Public Health at (513) 946-7637. All information that you provide, including your identity, is completely confidential. Please go to OHiv.org for more information and to find FREE testing – including at Hamilton County Public Health’s Clinical Services office on McMillan in Corryville. Click here to find PrEP Service Providers. Click here for OhioPrep’s Let’s Talk About Prep Forum. STD and HIV reports may be found on our report page.